At about 6:05pm last night, I decided to make this easy steak dinner. Or, to be more precise, this recipe was the one theHubby selected out of the three I suggested to him at 6:04pm last night. 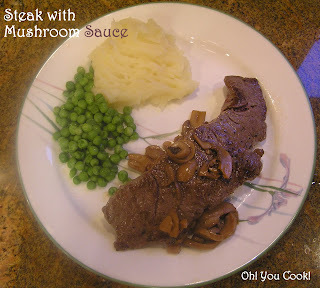 This would be an easy recipe even if I had fresh edible mushrooms available. Except that at 6:05pm last night I didn't have fresh edible mushrooms handy. There was this large fresh mushroom growing in the lawn after several days of rain, fog and humidity, but it would have been a bit rash (not to mention possibly fatal) to pick and use it, so that didn't count. One of the nice things about summer is not having to wear socks. I spend as much time as I can with only sandals adorning my feet. No having to match up socks on laundry day ... or trying to find which blouse a missing sock glued itself to in the dryer. Of course said sock chooses a shirt which for whatever reason doesn't get worn again for months, and when said sock again presents itself, another random sock takes its turn on another clothing item. Now that the evenings are cooler and I need something a little warmer to cover my toesies while walking Cujo, the sock cycle repeats, just like the cooling cycle of my dryer when I'm out of earshot and leave it running for hours. I miss summer. What does this all have to do with cancer? Nothing. I just wanted to share. You're welcome. In honor of Breast Cancer Awareness month, I made German chocolate cupcakes. 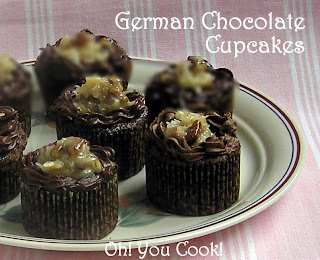 Why German chocolate cupcakes? Why not something pink to tie into Breast Cancer Awareness month?